I dressed up in red, and pushed off to witness “Crank for The Bank”, a foodbank benefit ride/race hosted by Fairfax Cyclery and the Gestalt Haus. 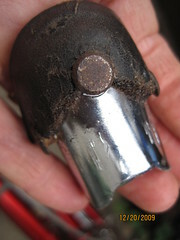 The driveway has a pronounced lip on it, and as I jounced down that two inch drop, my saddle gave up its forty year job. What I felt was a distinct sag all of a sudden. When I slid off the saddle to look at it while riding, I felt a sharp pinch in my thigh flab. After re-settling into the formerly comfortable saddle, I felt another pinch, stopped the bike, and realized that the saddle had split at the rivet. At the pub, people said “that’s the end of the saddle”. With some proofide, the leather might regain some souplesse. My thigh sports a double bruise, and will return to mayonnaise white in a week. ~ by jacquiephelan on December 20, 2009. Hmm, didn’t see that coming.